This project is by far one of the easiest and most rewarding DIYs that I have done in a long time! The clamp light reading lamp that I am about to unveil is a simple project that ticks all the DIY boxes! Is it something you need? Yup. Do you need any special skills? Nope. Do you get to pick your paint colour and choose from a rainbow of spray paint options? Hell yeah, you do! 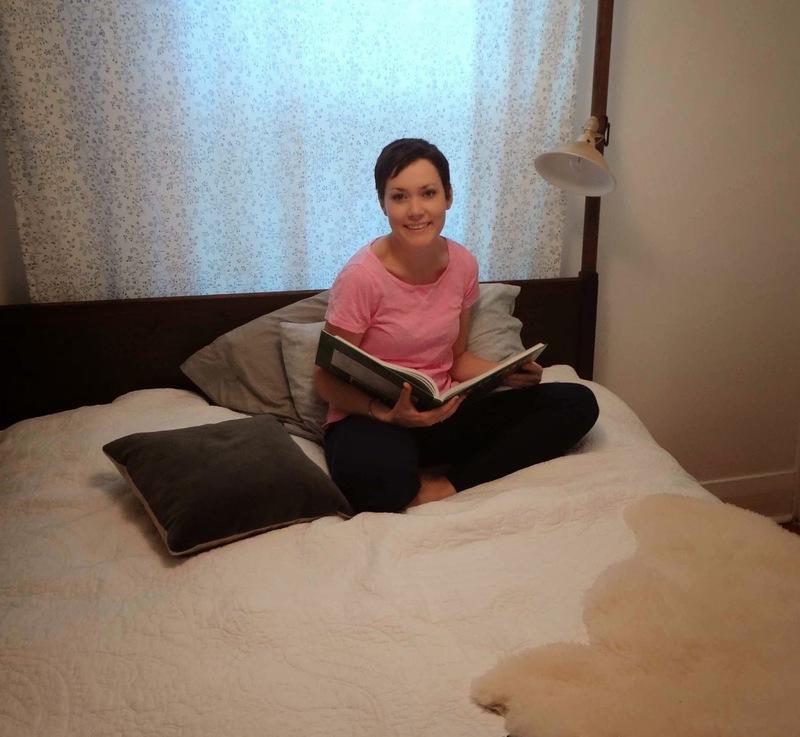 Ok, so here's the deal: when I got my dream bed into our bedroom, I realized that it didn't leave much room for side tables. Not the worst problem to have, we can live without bedside tables. But we are pretty attached to our bedside light. It's just nice to be able to climb into bed and turn the light off from in the bed. And of course, if you're reading you want a lamp close by. So what to do? We can't have a side table, but we can't live without a light! The solution has come in the form of a very inexpensive DIY project. 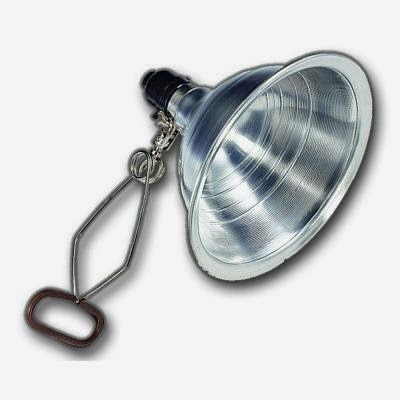 At Home Depot (and other home construction stores) they sell clamp lights. The little 7 inch lamps provide great light (they can take up to a 150 watt bulb) and are meant to be used as temporary portable lighting for whatever temporary portable lighting demands you may have around the house. 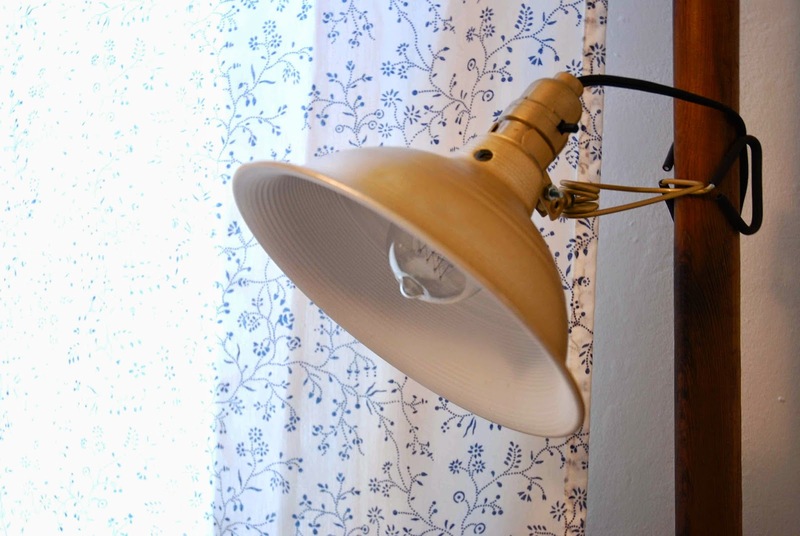 Of course, all you need is some love, some spray paint, and a fancy light bulb and you can turn one of these $8 lights into a charming reading lamp. 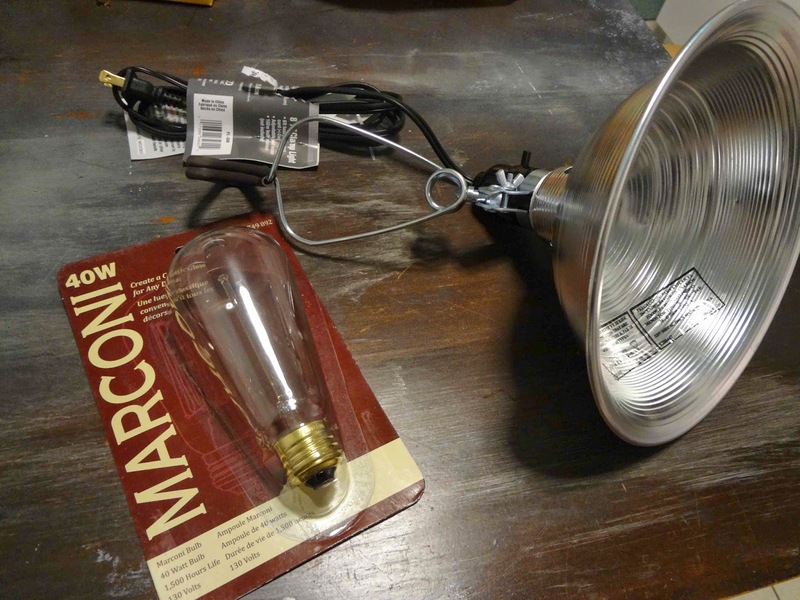 Not only is this project incredibly inexpensive, (a light for $8! 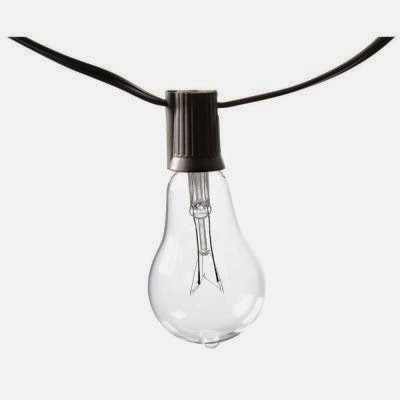 ), but this sort of vintage industrial lighting is really on trend right now. 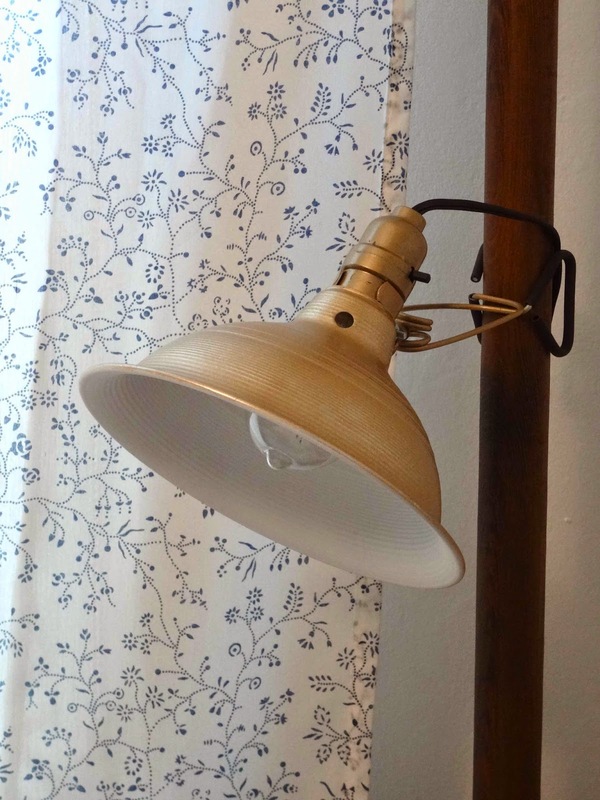 With this clamp light DIY you can make an industrial style lamp with a paint shade to match your bedroom and you'll still have money left over to buy an Edison bulb. (Other supplies that you may want, but do not need, are Goo Gone and a tack cloth). You can purchase all the supplies through the Home Depot, either in store or online. 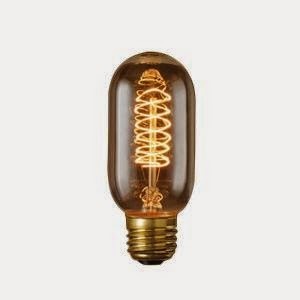 I definitely suggest buying the Edison (Filament) bulb through them, as some smaller lighting stores will charge as much as $15 or $20 for the vintage style bulbs. The best part of this project is probably choosing which colour you're going to paint the lamp. I did white spray paint on the inside and a gold /brass shade on the outside. If you want to get creative with your colour choices, go to an art store (not a home store) and you will have a wide variety of spray paint shades to choose from. 1. 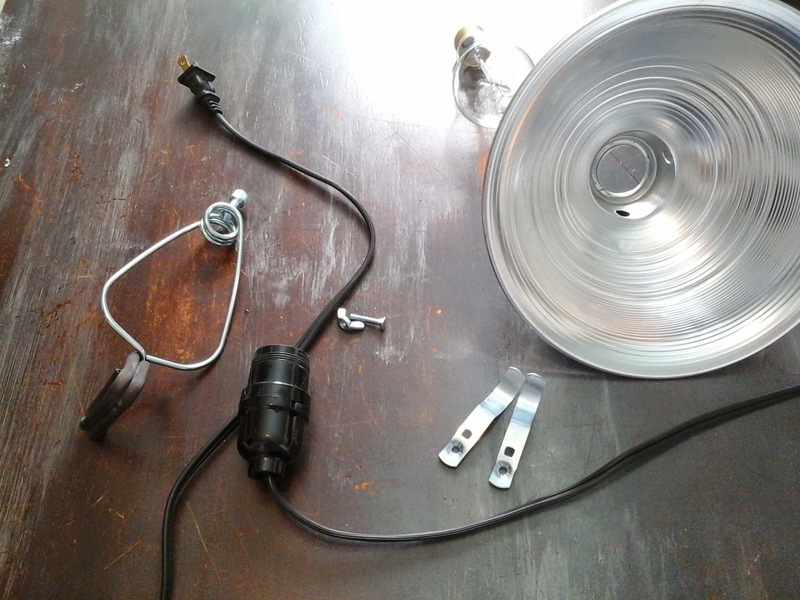 Disassemble the clamp light. A few twists and the whole thing comes apart fairly easily. Just remove the nut and bolt and go from there. 2. 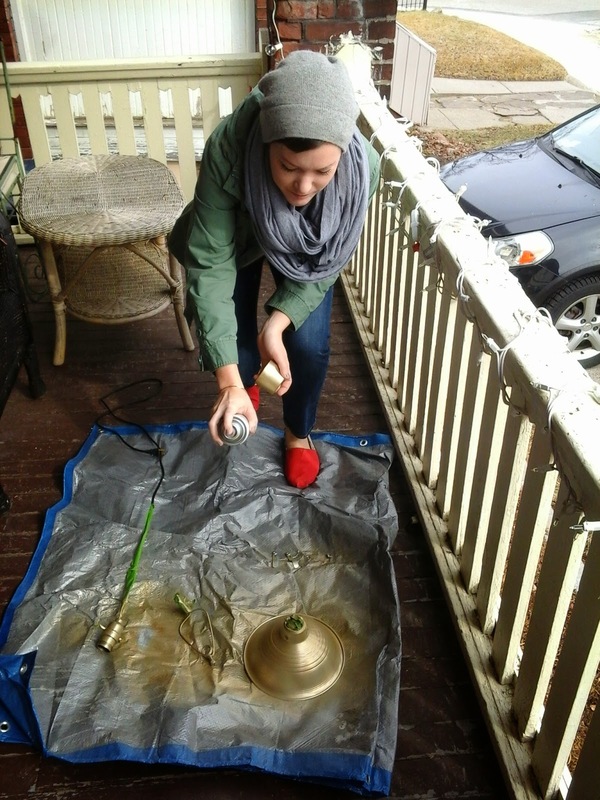 Clean the 'shade' of the lamp and prep for spray painting. Once the silver shade has been removed, wipe it with Goo Gone and paper towel to get rid of any residue from the price stickers. Next, wash with warm water and dish soap. Let dry. Just before spray painting, wipe the surface of the shade with a tack cloth to remove any dust particles. 3. Spray paint the inside of the shade. 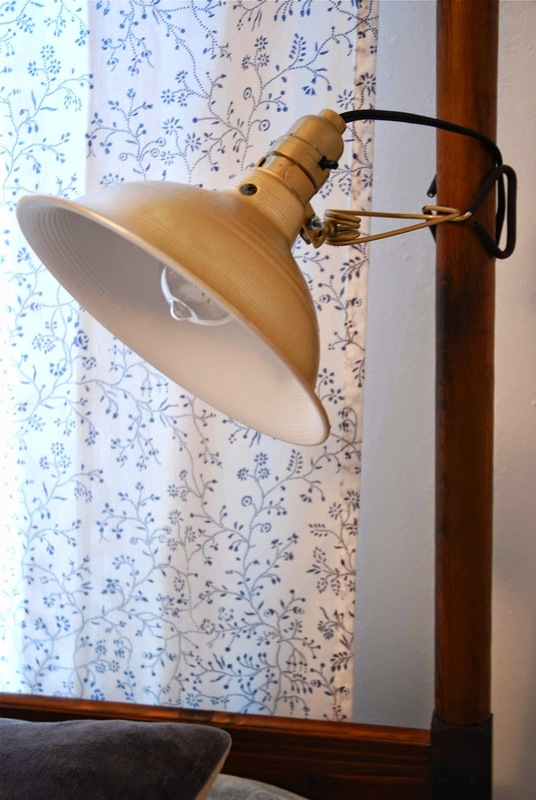 Lay the shade on a drop cloth either outside or in a well ventilated area. Spray the inside with your choice of paint colour. Spray lightly and do not worry about achieving full paint coverage. After 20 minutes, spray again. I like to do about 3 or 4 very light coats of paint. When spray paint goes on heavy it tends to drip and run. Doing multiple light coats will save you time in the long run. 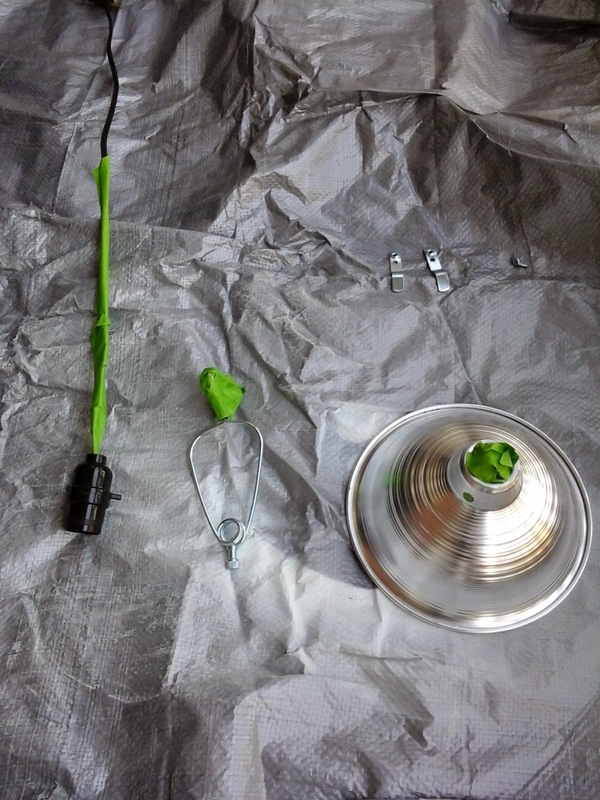 If you are new to spray painting things, there couldn't be a better beginner project than this. The clamp light is unfinished ridged metal. It's practically begging to be painted! The surface needs no special prep (ie. sanding) and the paint sticks very well because the shade is ridged and not flat or slick. 4. 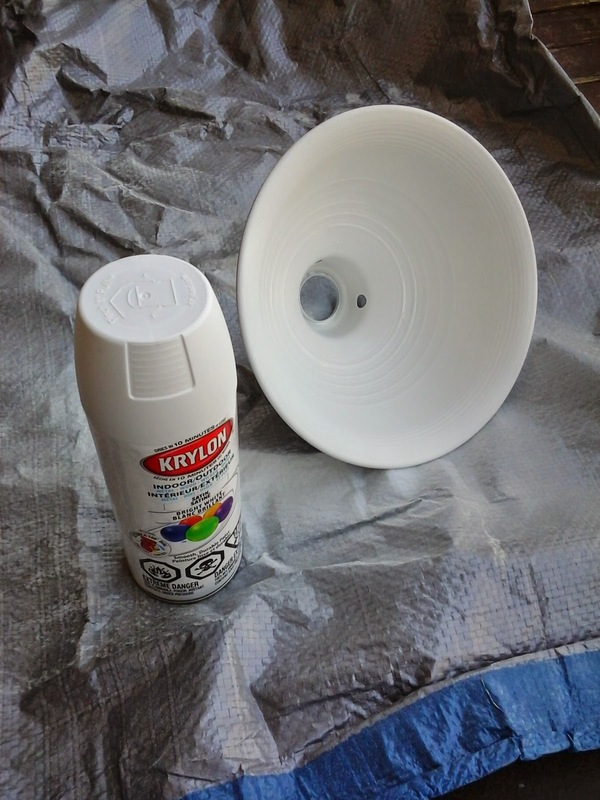 Use Painters Tape to get lamp ready for your second paint colour. Tape off the top of the shade, the cord, the rubber clamps, and anything else that you don't wish to paint with the second colour of spray paint. No need to tape of the rim of the shade. Just place it on the ground and spray from above. I got a nice straight line where the gold meet the white, and setting it down flat was way easier than trying to tape off a circle. 5. 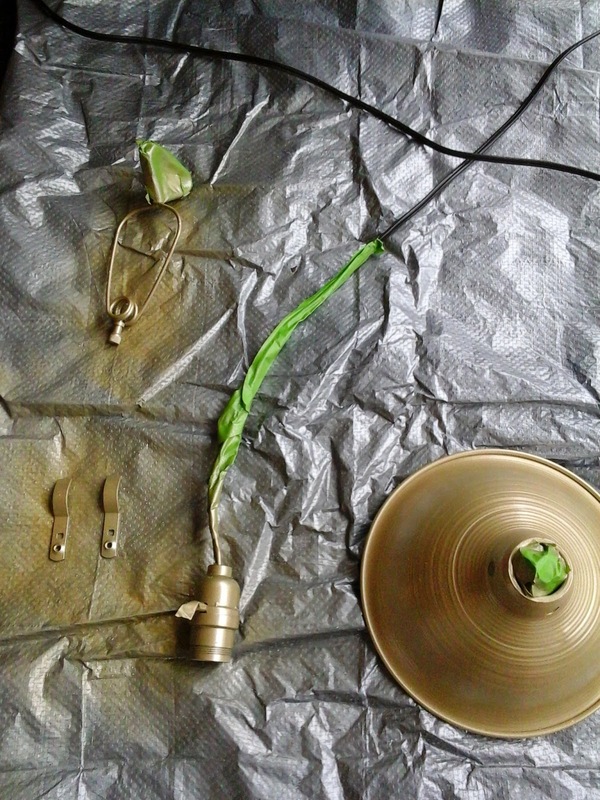 Spray paint all parts of the light with your colour of choice. You can paint not only the shade, but the wire arm, the plastic socket and the smaller metal parts including the nut and bolt. I had trouble deciding what colour to paint my lamp. I liked the idea of using Hunter green to contrast with the white on the inside, I think that would have had a nice antique look to it. I finally settled on the brass colour because I wanted something softer for the bedroom and because it was a spray paint colour that I already owned. Navy and white would look so vintage and cool, or what about brass outside and a really light pink on the inside? So pretty. Anyway, same deal: less paint, more coats. Flip the items over for full coverage on both sides. It's finally warm enough outside to use spray paint and I'm all about it!! The reassembly is very straight forward. Once the light is back together in one piece, add whichever Edison bulb you like and find a nice spot for your super cool vintage inspired reading light to live! 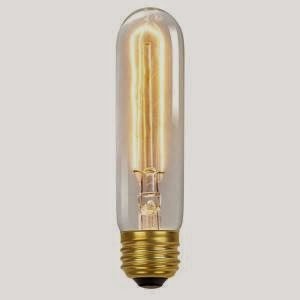 Keep in mind that the Edison bulbs typically come in 40 or 60 watt and they cast a warm orangey glow. 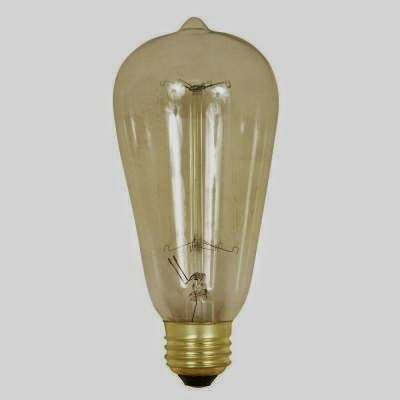 If you want your reading lamp to provide serious light, you may have to go with an ordinary bulb. Oooh, and look what else they have! For $20 you can order a string of patio lights with 10 little Edison style bulbs. How warm and inviting would that look on a back patio, strung through the trees? Oh, I can't wait for summer to get here! I really thank you for the valuable info on this great subject and look forward to more great posts. Thanks a lot for enjoying this beauty article with me. admission in class 11 in cbse school in delhi I am appreciating it very much! Looking forward to another great article. Good luck to the author! All the best!